s I grab the steaming steel pot and pour a dark, rich liquid into my cereal bowl-sized porcelain mug, a warm ambrosial fog ascends into my nostrils before blessing my taste buds. One a day keeps the doctor away. Two a day keeps the migraines away. I love coffee. I can’t live without it. I drink for pleasure. Not for purpose. I like it black. I like it in the mornings and evenings. My barista knows how I like it. Fill it to the brim. Extra hot. No room please. Blonde, medium, dark, French, Italian, American. I really don’t have a preference. That is until; I came face to mouth with a Latin native. Nestled in a 1500 sq. 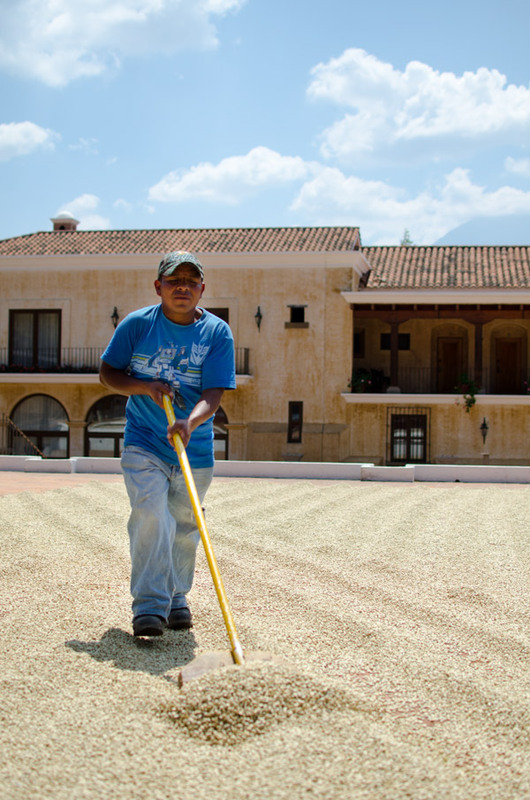 ft. estate in Antigua, Guatemala, I met the cup of my dreams. He was smooth, sweet and pleasant on the mouth. His fragrance was hypnotizing, his after-taste was addicting. I wanted more. But it was over before I knew it. I tilted my cup, squinted my left eye and savored the last drop. I sped to the gift shop, grabbed two bags of the finest arabica beans to feed my addiction for when I arrived back home. In less than a month, I rushed his welcome. Although I was an accommodating host during his stay, I felt guilty about the amount of time and effort put into preparing my perfect preference that I downed within record time. But it wasn’t love at first sight. I, a wandering American, and he, a delicate inhabitant locked away within an iron black gateway. Enter Finca Filadelphia, the birthplace of my Guatemalan affair. It wasn’t easy getting there. I hopped in the back of a safari 4-wheeler, passing the bumpy terrain of Antigua’s cobblestone streets. My anxiousness grew as I uncomfortably bounced in and out of my seat. It was as if the roles of a Disney animated movie were reversed. I imagined him waiting at the top of his balcony as my henchmen and I galloped our way through a dangerous forest. We came to the iron black gateway. It was just as I had pictured. The gate slowly crept open and I entered an entirely different world. The uneven cobblestone street turned into a smooth concrete pathway. The loud commotion from the tourist-populated city turned into a peaceful ambience that trickled through the rows of varying lush greenery. I peeked my head out to capture a whiff of Antigua’s caffeinated atmosphere in its rawest form. The fresh and pure scent would be the first informal introduction to our piquant two-hour rendezvous. I, along with a group of friends, met up at Finca Filadelphia Coffee Resort’s ticket booth. We met with our tour guide, who started with a short on-foot trek to the nursery. It was like flipping through a lover’s childhood album, except it wasn’t full of embarrassing naked bathtub photos. It was an impressive recollection in which I learned that it took only three years for his plant pot veins to mature into a tree. Maturity was a plus two-points for me. Dealing with several tasteless short stints, which didn’t leave a lasting impression since I can’t even recall one name, it was difficult to retain my eagerness. I shook my head back into reality as our tour guide allowed us to hand pick a ripe bright red bean from one of the trees. I halved the Arabica bean and teased with its sweet pepper juice that was far from what the finished product would taste like. A little taken aback from the sampling, we hopped back onto the truck and made our way to the processing facility. Inside the facility were large cubed machines with cylinder pipelines running to the next one. These machines stripped the beans’ skin and removed its gooey substance. I was happy to find out that only the best make it to the next step. Dark and irregular colored beans are made into instant coffee. Creamy white unmatured beans, however, are laid out flatly and turned over every couple hours to dry under the sun. The next part of our tour overlooked the estate’s five star hotel. However, the spacious balcony, which we were now standing on, and the Spanish-influenced architecture was overshadowed by Antigua’s mountainous landscape clouding in the far distance. Covering the brick outdoor balcony, were beans laid out on the floor to dry under the sun. Collectively, the beans formed squares, circles and diamonds, in which were shaped by Filadelphia’s workers who used a wooden shovel to turn the beans over. After two weeks, the beans are examined on a conveyor belt apparatus. Beans with slight defects such as discoloration, size or shape, are eliminated by hand. The last part of the tour overwhelmed my senses. As I stepped into the roasting room, I was hit with a warm, rich aroma that quickly awakened my caffeine craving. During the roasting process caffeine and flavor are released from the tiny coffee seeds. As I stared into my cup of Guatemala’s finest, I couldn’t help but think if he was settling for less. He was so refined, so pure. And I, in baggy, ripped jeans and unwashed hair. He was definitely a looker. Afterall, he was judged on appearance alone several times before making it into my cup. But he was so much more than just that. He was the entire package. He encouraged me during crunch time before a big test, motivated me to burn those extra calories at the gym and my shoulder cry on when Jack let go of Rose. Just like my past relationships, this one ended short as well. However, I did remember his name. 2014 © All rights reserved International Reporting Class, Cal State Fullerton.